I have added some interesting functionality to the SAITO application. It had originally managed attendance and accounting for martial arts schools. The idea of keeping track of videos, weapons, clothing and so on as inventory (either to retain or resell) was a bit of a extension, but I also needed to track progress by martial art set and movement. That meant adding movement names, for example, for the 83 movements in the Xin Jia (New Frame) #1 set of Chen Family Tai Chi Chuan as well as the 60 movements of Xin Jia 2 and the 15 other Chen Family style sets. This was to support the idea that a student would be connected to various sets and would receive daily grades on each movement. The motivation for this was to provide a daily statistical anchor point for the assessment of not only other aspects of a student’s life – medications, diet, sleep -but also an evaluation of teachers. 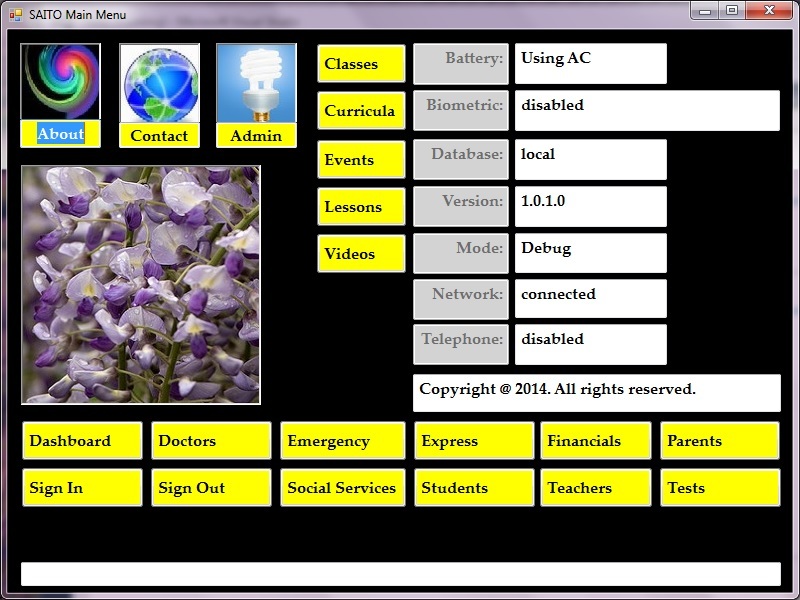 The main menu (below) served as a switchboard to get to the increasing number of submenus as support was provided for doctors, parents and social workers.